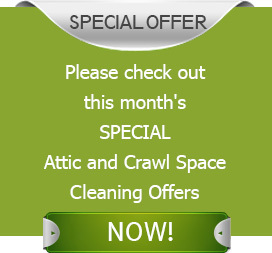 Attic & Crawl Spaces are seldom used but form an important place of the property. They help provide useful areas to store the ‘take out when in need’ products and commodities of the house. Quartz solutions services include Attic cleaning, attic insulation (Repair and Replacement), attic decontamination, radiant barrier, air duct repair, replacement and cleaning, crawl space cleaning, crawl space vapor barrier, crawl space floor insulation, crawl space insulation, rodent proofing &rodent control and more. Also, the all important insulation system has roots in the attic. But more often than not, little attention is paid to maintain these all important places. These areas often grab attention when the major damage is done. To avoid huge loss to property, regular monitoring, proper maintenance and upgrading is required. Quartz Solutions thus proves to be a comprehensive solution for keeping your Attic & Crawl spaces useful and efficient for years to come. It will not be late when the bugs and termites will spoil and shatter your whole attic. Their presence, if left unattended, will soon turn into a nightmare, causing huge emotional and financial strain. Insects like cockroaches, spiders, fleas and wasps pose a serious health concern. Leaking ducts impair the property’s insulation capacity. They also inflate the energy bills manifold. Animals, like roof rats, bats and raccoons wreck havoc in the property. They damage structures and foundations, leaving behind an unhygienic mess. Excessive moisture promotes the growth of mould and mildew, damaging the entire foundation of the property. 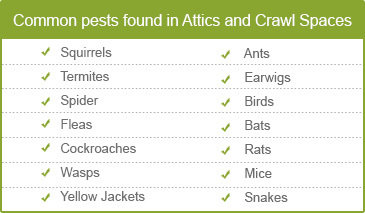 A careful inspection of the attic and crawl spaces goes a long way in maintaining a healthy and efficient property. Assessment of the insulation system, wires and connections and testing the area for presence of insects and harmful gases; we at Quartz Solutions are apt at doing everything. Our men will carefully check the area and take note of the existing as well as impending troubles. Once the real situation is out in black and white, the team will design and execute a meticulously thought plan to eradicate all kinds of infestation from the Attic & Crawl spaces. We understand the worth of your property and value your hard earned money. Quartz Solutions is thus the most competitively- priced, effective and viable company in the business. A small borough with barely 12,000 residents,Edgewater is located along the Hudson River in Bergen County, NJ. It’s beautiful and serene surroundings and pleasant people make this borough a wonderful place. We, at Quartz Solutions, take pride in contributing to its sereneness and beauty in our own sweet way. Our management and enhancement solutions help people keep their properties in top-notch condition. Hurry! Look no further and give us a call to book your free inspection 201-205-2042. They replaced the old insulation in the attic with Batt insulation. Very knowledgeable and patient. Wrapped up the job in two days. Organized, clean and effective work!